Happy Thanksgiving! If you are reading this post on Thursday, I am currently doing one of three things: cooking (while watching Macy's Thanksgiving Day Parade and drinking Mimosas), stuffing my face or walking off turkey at Walt Disney World. This is the first holiday we will spend together as husband and wife! Although we are renting a house, you should have seen my car yesterday - I literally traveled with items we received from our Wedding Registry. My car was packed with cookware, my new mac daddy slow cooker and my blender. Although most of our wedding guests contributed to our amazing honeymoon, we did receive a few items which I am very thankful for. One item we registered for was Calphalon Unison Cookware. While they don't carry that exact model at Target, I did notice they are carrying Calphalon Stainless Steel Cookware now! Amazing price too - 12 pieces for $250. 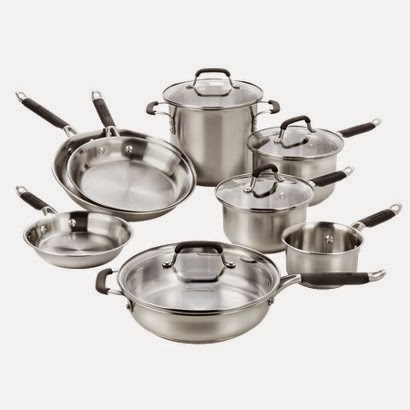 These are great pans for cooking, frying and sauteing. Besides my famous macaroni and cheese, one item that is always asked for on Thanksgiving. Brussels Sprouts. I made this dish last year for the first time and it was a hit. Gabe's family hated Brussels sprouts - I changed their mind. This will be on our menu today! Heat oil over medium heat in a roasting pan or large skillet. Add the pancetta and cook until golden brown and crisp. This took quite a while for me since I wanted to make sure the pancetta was extra crispy. Remove the pancetta to a plate lined with paper towels. Add the shallots to the pan and cook until soft. Add the Brussels sprouts and toss to combine. Season with salt and pepper and roast in the oven until the Brussels are cooked through and golden brown. Transfer to a platter and top with the reserved pancetta. The Target Giftcard Giveaway will kick off my 2nd annual 12 Days of Christmas Giveaway (actually making it 13 days of giveaways)! Let me know in a comment below what your favorite holiday side dish is. Make sure you use the rafflecopter widget below and come back on the dates mentioned below for amazing gifts. My favorite is baby glazed carrot. I like Butter-Pecan Sweet Potatoes. Mashed potatoes are my favorite. My favorite is sweet potato soufflé. I also make a mac and cheese that we can't go without on Thanksgiving! And i MUST try the brussel sprouts at Christmas. They look delicious! Hope you had a wonderful Thanksgiving! My favorite holiday side dish is my dad's turkey and dressing. I love his potato salad and pea salad too! I love sweet potatoes baked with apples and cinnamon and pecans. I like mashed potatoes with bacon. We love green bean casserole. My favorite side dish is the stuffing. Favorite holiday side dish is my vegan gluten-free stuffing! My favorite holiday side dish is definetly deviled eggs. yum. I like sweet potato casserole. My favorite is southern style macaroni and cheese. I like that crazy green bean thing with the crunchy onions that you only see once a year! This one is so tough. Buttttt....I suppose mashed potatoes and gravy (so comforting) orrrrr squash casserole. Love the traditional stuff. 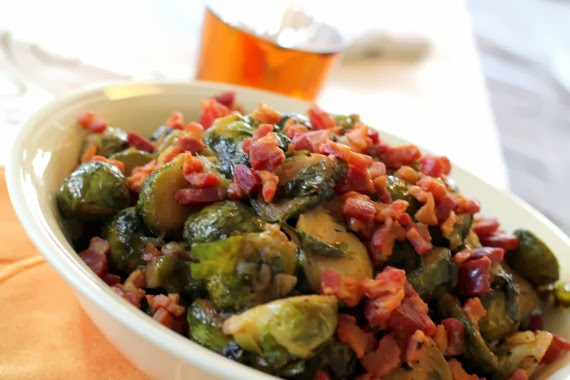 Also love the brussels sprouts and pancetta combo! One of my favorites to make! My favorite side dish is sweet potatoes. side dish....ALL of them!!! Give me those sweet potatoes! I love cranberries as a holiday side dish. I love corn! It's my favorite. MMM My favorite side is is stuffing! Yum! My favorite holiday side dish would be sweet potato casserole with pecan/brown sugar/ coconut topping. My favorite holiday side dish is Cornbread Dressing made with fresh sage and pecans.